Whose way is the best way to make flawlessly scrumptious scrambled eggs? William Sitwell heads on a quest to crack the secret to the perfect scrambled eggs. Hotels get it wrong, top chefs can’t agree and its rumoured you can now even buy them in a bag. But why is one of the nation’s favourite brunch dishes so hard to get right? Waitrose Food editor, MasterChef critic and famous foodie William Sitwell has set himself the task to find out. In today’s Daily Mail he speaks to the great Marco Pierre White, Micheline-starred chef John Williams and cook Rose Prince to unearth their scrambling recipes. As it seems, no one can quite agree. 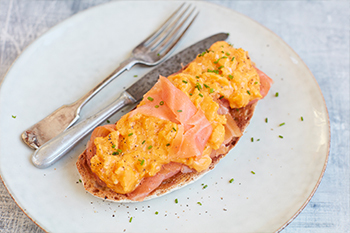 On Thursday 27th September, William will bring together a group of food writers and chefs, who under laboratory conditions, will test recipes from the great and the good in The Clarence Court Great British Scrambled Egg Challenge to find the ultimate recipe. Be sure to be following us on (Instagram) and (Twitter) as the secrets to the most scrumptious scrambled eggs unveil. Read about William’s egg hunt in the Daily Mail here.